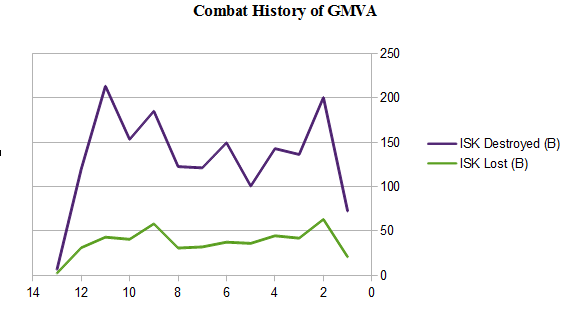 »Fleets»Statistics from the warzone. . .
Statistics from the warzone. . .
X Axis is in months. Since the graph is a monthly chart, we’re only seeing the first 12 days of January; history hasn’t finished being written. After a summer lull, action picked up again in the fall/winter months with a massive spike in Isk destroyed during december, topping 200 billion isk. In terms of pure spaceship destruction, the month of December was by far the highest, with more than 2600 ships destroyed. We are also pleased to report that for every single month since the founding of the alliance, we have maintained a 70% or higher combat efficiency rate. Overall, 2012 has been an excellent year for our fledgling alliance, here’s to another fantastic year in 2013!